Why Does Alcohol Lower Blood Sugar? Tiffany Schulte has been been writing since 2003. She writes for LIVESTRONG.COM and works as a registered dietitian specializing in adult and geriatric nutrition. Schulte holds a Bachelor of Science in dietetics from Point Loma Nazarene University and a Master of Science in nutritional science from California State University, Long Beach. Many health benefits are associated with drinking a moderate amount of alcohol each day -- such as lowering blood pressure, improving insulin sensitivity and reducing risk of developing cancer and heart disease. However, excessive alcohol intake can have negative health effects, such as liver disease and cancer. Alcohol can lower your blood sugar and, if you are diabetic, may interact with your diabetes medication. Alcohol is absorbed through the gastrointestinal tract and metabolized through several pathways. The majority of alcohol metabolism takes place in the liver, which is also the primary location of glucose production. Because of this, alcohol intake can interfere with the liver’s production of glucose and may cause hypoglycemia – or low blood sugar. Alcohol intake can lower blood sugar immediately and up to 12 hours after ingestion. 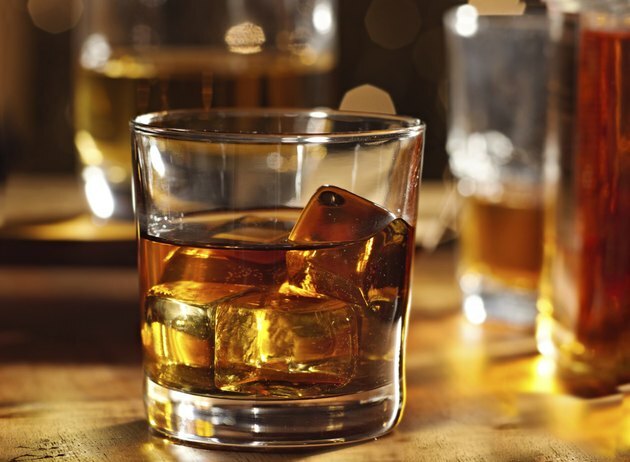 While this effect can occur both in diabetics and non-diabetics alike, diabetics should use additional caution when drinking alcohol, especially if taking glucose-lowering medications such as insulin. Symptoms of hypoglycemia are similar to alcohol intoxication, which include dizziness and disorientation. If you have diabetes and decide to drink, it may be helpful to wear identification that states you have diabetes to ensure you receive the proper care. Avoid consuming alcohol on an empty stomach and if you do drink, eat a snack that contains carbohydrates either before or while you drink to help avoid hypoglycemia. According to the American Diabetes Association, check your blood sugar before and after you drink to make sure it is within a normal range of 100 to 140 mg/dL. Paying attention to the proper serving size of alcohol can help avoid excess consumption. One serving of alcohol is approximately two drinks per day for men and one drink per day for women. A serving of alcohol is equivalent to 5 oz. of wine or 1 ½ oz. of distilled spirits or 12 oz. of beer. To avoid over-drinking, try sipping your drink slowly or mix alcohol with non-caloric beverages such as club soda, diet tonic water or diet soda. Finally, enjoy a snack or meal while drinking to prevent low blood sugar. If you do not already drink alcohol, no evidence supports starting for the health benefits. If you have diabetes and drink alcohol, consult a healthcare practitioner, such as a registered dietitian, to set up a meal plan that incorporates alcohol safely into your diet. Can a Shot of Vodka Lower My Glucose? Does Vodka Help You Burn Fat?